The weight loss journey Part 1. How many times have you been inspired by what other people have achieved? What did you do with that inspiration? I cannot tell you how many times I have been inspired to achieve by someone or something, only to fall short of my goal and give up. So the questions have to change, how do I motivate myself to achieve my goals? "Action Conquers Fear: Your choice to change must come from deep emotional desire". That means that you cannot just want to change, you have to be compelled enough to act... From the first moment I watched Chris Powell on his show Extreme Makeover, Weight Loss Edition, I was inspired. I could relate with just about everything he was teaching. The people he was working with had extreme health and psychological issues and needed to be rescued from themselves. Isn't that how you feel sometimes, helpless and in need of being rescued? I did. I was going through a difficult time in my life and needed a way to escape. You see my mother in-law (Nora) was diagnose with stage 3b lung cancer and, I had just been laid off from work. My wife and I saw the blessing with me being laid off. It allowed me the opportunity to stay home and take care of Nora. The only problem was, I wasn't prepared for what was about to happen. Each day that I spent with Nora brought us closer and closer. I needed an outlet so I came up with this idea to put the Choose to Lose program to the test. The next day I went out and bought the book Choose to Lose by Chris Powell. I figured if his program can take a person from obese to fit in just one year, why not give it a try. Once I started reading his book I couldn't put it down. I had so many "deer in the headlight" moments, everything started making sense. I studied that book from cover to cover. I even put together a worksheet to help me stay motivated. I gathered up a few of my friends, including my wife, who had similar issues with weight. We setup a workout schedule and made a commitment to ourselves. We started our workouts with simple exercises like, punching and kicking the bag, walking in circles, step ups and step downs on the stairs, squats, etc. At the end of every workout, we spoke of our weekly struggles and what we did to conquer those challenges. We held each other accountable for our actions. Over time the workouts became easier for all of us. We had to increase our workouts from 30 minutes to 1 hour and from two days a week to three. The weight was coming off and our bodies were changing. I got to a point where the hour long workouts weren't enough; I had to step it up. I contacted another friend and started hitting the gym with him. Now my schedule was Monday - Friday, gym - 2 hours in the morning, Monday - Wednesday, one hour with the group in the evening, Monday - Thursday, karate - 2 hours at night. My body and mind were being pushed in such a way that everything became easier. My strength and flexibility increased, my energy level was going through the roof, and my mind was focused and easily occupied. All of this time training helped me escape the daily struggles of reality. When I started my journey back in 2011 I weighed 350lbs. and I was wearing a size 46 pants. After just 11 months of hard work I dropped 96 lbs. and went from a size 46 to a size 40 in pants. I was finally approaching my goal of 225lbs. ; but then Nora's health started to deteriorate. I was smacked back into reality. I had to stop almost all of my training to focus my energy on her. All of Nora's daily routines changed, and so did mine. It didn't matter though, I enjoyed every moment that spent with her. During this time, however, I began to slip back into my old habits. The stress was unbearable but I couldn't leave her side. Nora lost her battle with cancer in the summer of 2012. Her struggles were finally over. The pain of losing her was devastating for me. She was able to move on to a better place; while I was left here to relive every moment. People say that time can heal all things but sometimes those things leave deep emotional scars; scars so deep and sensitive, the slightest touch can bring back all the emotions. I still have problems when talking about Nora to this day. Our time together was special and I thank God for every moment. Well here it is, 2015. Now, I feel it's time to get back on the path of becoming healthy. Jimmy Parsons has trained in the Martial Arts for over 20 years. He received his black belt in Ed Parker’s Kenpo in 2004. 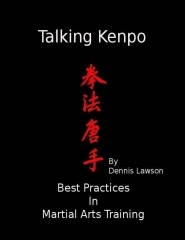 Mr. Parsons is the owner and head instructor at the Kenpo Evolution studio in Salisbury, MD. His thesis project for Associate Instructor certification applies Kenpo principles to working on the ground with an opponent.